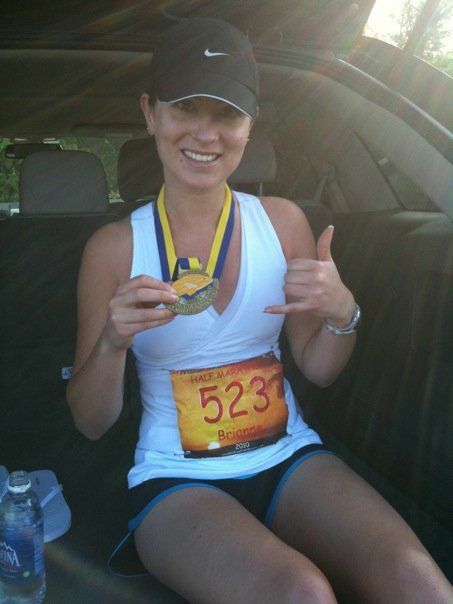 For me, I knew 2011 was going to be the year I completed my first triathlon. Not only did I have no idea what I was doing or where to even start, but also I didn’t even know how to swim. With my target goal in sight (meaning I signed up for the triathlon before I even had a bike or knew how to swim), I wrote down all of the steps I needed to take in order to get there — the first being to get a good triathlon coach, which helped take all the guesswork out of the rest of the steps! So if you made a resolution to be healthier/lose weight/run a 10k, and maybe laced up your running shoes for the first time in a long while today and went out for a New Year’s jog… kudos. BUT — make sure you have a plan and a bunch of tiny little goals to help you reach your big goal. But enough about goal setting. As for my 2012 fitness goals, I’d obviously love to improve my running times (maybe a sub 4-hour marathon?) and my triathlon times. I also want to become a better swimmer — I’d say I want to improve my swim stoke, but as of now I don’t even have a swim stroke to improve; it’s more of a flail that somehow propels me forward enough to call it ‘swimming’. Haha. I’d also love to do more trail running, and can definitely see an ultra in my future. Twitter, runners and cancer research	Super awesome exciting announcement! Yay, Bri, what an inspiring and positive post! 2011 was a great year for me, trainingwise, too. I did some great adventures with my running partner, Dave – highlights were running the northern half of the West Coast Trail, as well as to Della Falls and Love Lake and back, each in a day. Dave and I run for the fun and adventure of it (you can find us on http://daveandjackierun.wordpress.com), but we’ve both found that these very long but very slow runs have improved our base level fitness SO much, and we have both done really well in the races we have entered this year (one of my highlights was beating my marathon PR by 45 minutes – that is dropping over 1 min per kilometre on my pace!). I don’t know what 2012 will hold in store – Dave and I are talking about our training and racing goals at the moment, juggling our desire to do Ironmans (he has done lots, I never have) and our desire to do ultras (I have done several, he never has). We are going to do it all – we are just figuring out what order to do it all in! One of my goals for 2012 is running Juan de Fuca… that would be a very fun thing for all three of us to do together! Hopefully we’ll see you thereabouts, or on one of the #YYJ trails. Happy New Year! Thanks Jackie! I love your running blog, really inspired me to hit the trails more this year. I hope to finally do the JDF trail too, and I agree it would be awesome if we could all do it together! Hello 2018: My annual non-New Year’s resolution blog post - Run. Lift. Yoga.